As one of the leading UK Industrial Flooring Contractors, Euro Resin Solutions Ltd are experts in providing the latest durable Industrial Floor Coatings and Screeds for all areas of industry. We use fast curing, high performance products, which give our industrial flooring customers the best possible application. With years of knowledge and experience in the industrial flooring sector, ERS has the solution to most industrial flooring problems. We use hard wearing, fast curing products to give you the best possible application. We work hard to ensure we meet all time constraints to ensure the smoothest installation possible. We regularly complete work involving pumped screeds, hand applied screeds and pumped smoothing underlayments. 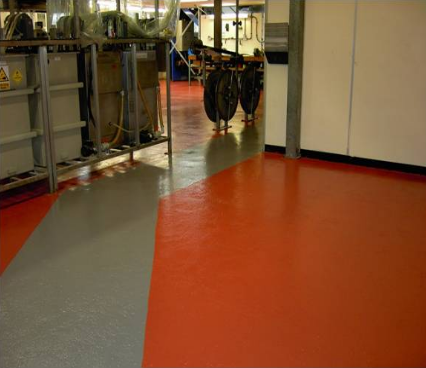 We also undertake projects for floor coatings, floor seals and protective coatings. With a variety of past projects and a wealth of experience in industrial flooring, we have developed extensive knowledge of the sector. We have undertaken Industrial Floor Coating work for a variety of clients and sectors including, warehousing, food processing, pharmaceutical, engineering, printing, aerospace, automotive and breweries, amongst others. Our skilled team of industrial flooring installers work hard to ensure all deadlines and requirements are met. With experience of working in all environements, our team pride themselves on achieving the best quality finish regardless of conditions. All can be installed by our own installation crews who are all qualified to NVQ level 2 Insitu resin flooring.